Modern maple syrup production has all but eliminated the chances of lead contamination in maple syrup. However, double checking your equipment can never hurt, no matter how modern the operation. As part of a checklist, there are industry-wide practices to ensure that equipment is not unintentionally introduced to lead from the tap to bottle. 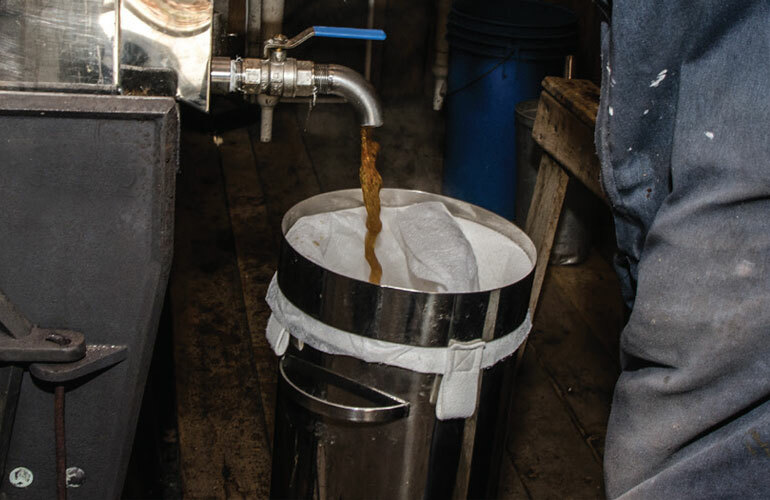 Following are some places to evaluate in the sugaring process where you can double check to ensure there’s no chance of lead-contaminated maple syrup. The lead in maple syrup and most types of products that are consumed is often referred to as dissolved lead. “There are two forms that could appear,” said Timothy D. Perkins, Ph.D., research professor and director at the University of Vermont’s Proctor Maple Research Center. “One is dissolved lead, [which] you can’t see or taste or smell. You can only detect it via some type of analysis. The International Maple Institute has recommended guidelines to ensure filtering is effective in removing any potential “sugar sand” or niter from maple syrup. Filtering should occur at at least 185 degrees Fahrenheit and should use food grade equipment. If a plate filter is used, stainless steel or cast aluminum is recommended, while stainless steel is an acceptable material for canister pressure filters. Pumps constructed with brass or bronze alloys are not advised to filter lead from maple syrup. Where can lead exposure exist? Perkins mentions that buckets made before the 1990s are a potential source of lead contamination, along with storage tanks or evaporators manufactured prior to the 1990s. The movement to lead-free equipment took place during the mid-1990s, as Perkins explained, when maple processing equipment manufacturers stopped using lead solder in place of lead-free solder. Manufacturing methods eventually transitioned into welding equipment, including pans and storage tanks versus soldering. The 2015 publication from the International Maple Institute explained in depth these two collection processes. The institute recommends either “aluminum, stainless steel, or food grade plastic” spiles to tap sap. Their guidelines point out that terneplate or “old tin” spiles should be specifically avoided because of the potential to introduce as much as 1,700 ppb of lead into sap. Sickler described how evaporator pans containing lead can pose a serious threat of contamination during processing. The International Maple Institute notes the potential sources during the processing phase includes galvanized pans, along with lead soldered stainless steel pans, before 1994. However, Perkins said that beginning in the later part of the 1990s, virtually all pan manufacturing consisted of lead-free TIG welding methods of stainless steel. Another potential source of lead contamination, as the International Maple Institute and Eric Feigl-Ding, an epidemiologist and nutrition scientist at Harvard School of Public Health noted, includes the source of water used. The International Maple Institute explained that water should comply with local and national water safety standards when used to clean maple processing equipment.